Recently, at the D23 Expo 2017, we saw an assembly of heroes unlike anything we had ever seen before. Many of the stars of the upcoming “Avengers: Infinity War” came together on stage to create quite a scene. The Avengers truly assembled. 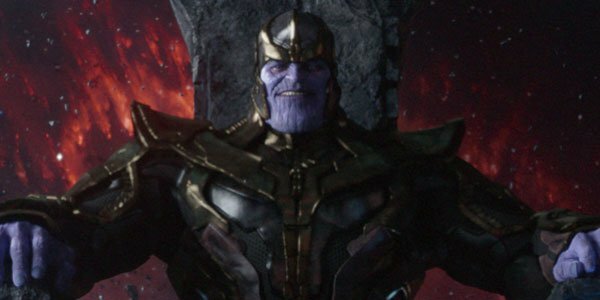 This film will be the culmination of everything we’ve seen in the Marvel Cinematic Universe so far. Captain America, Iron Man, Thor, the Hulk, the Guardians of the Galaxy, Spider-Man, Black Widow, Hawkeye, Falcon, Ant-Man, Doctor Strange, Black Panther, Winter Soldier, Loki and more will all come together to take on the most serious threat they have ever seen. With this incredible group of heroes assembling for that film, the question remains: what happens next? Eventually, Captain America and Iron Man will have run their course and it will be time to get some new heroes in the mix. Spider-Man just joined the MCU and Black Panther and Captain Marvel are newcomers as well, but there are certainly a few open spots. Marvel definitely has no shortage of great characters to draw from. It seems like a no-brainer that we will eventually see characters like Nova, the Sentry and Amadeus Cho. Yep, Flatman. Also known as the 2-D Avenger, Flatman’s abilities consist of his body being… flat. He can also contort his body into origami for whatever purpose he may need. To be honest, origami shapeshifting doesn’t have too many purposes that come to mind. He is apparently also very skilled in hand-to-hand combat, but one would think that even a light breeze could really throw off his game. I wouldn’t expect to see this two-dimensional hero popping up on the big screen. Jackson Weele is a criminal with a weapon that was made for him by the Tinkerer. That sounds like a lot of other Marvel villains, but trust me, this one is unique. Weele’s weapon is a wheel. Fitting right? Almost feels like the Tinkerer was just messing with him. 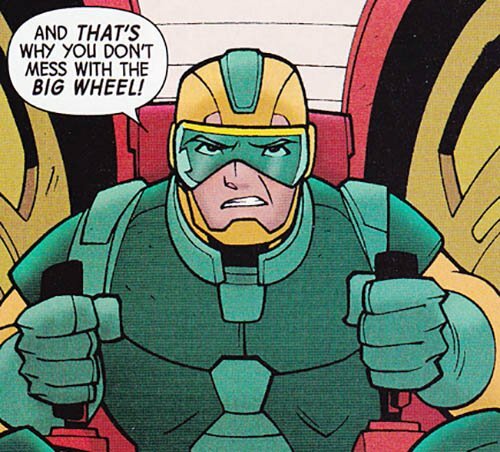 Believe it or not though, Weele and his wheel-shaped vehicle have tangled with Spider-Man several times in comics, cartoons and video games. I don’t think he’ll be rolling into the “Spider-Man: Homecoming” sequel though. Get it? Rolling? Cause he’s a… you get it. With a name like Devil Dinosaur, you’d automatically assume he’s a villain right? Well, he’s actually a hero. 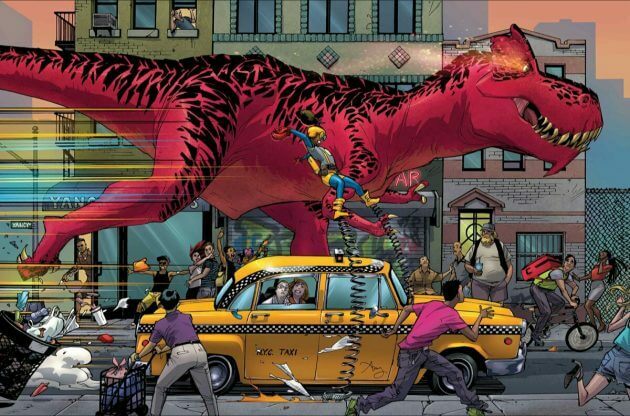 And not only that, Devil Dinosaur is actually the main protagonist in two different series. The most recent series is currently running and is titled “Moon Girl and Devil Dinosaur” because of course it is. Devil is obviously from an alternate dimension called Dinosaur World, but he has made his way to New York on several occasions. Although, I’m not sure a movie titled “Devil Dinosaur” would be taken seriously. I can’t make this up. Dinah Soar. Do I even need to explain why this is ridiculous? Ok, I’ll try. 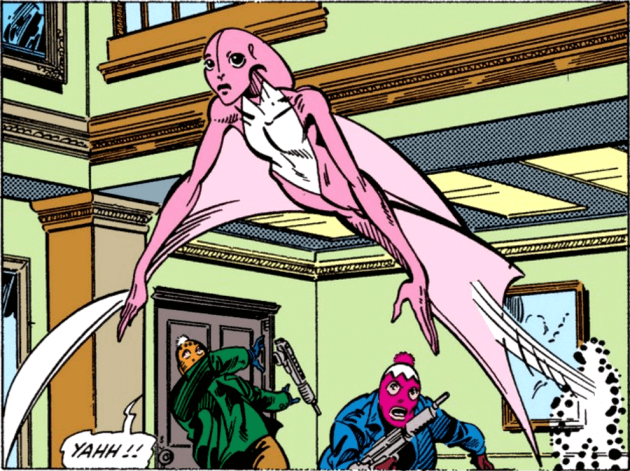 Dinah is essentially a human pterodactyl from the Savage Land, a secluded jungle habitat where dinosaurs still exist. Ok, I don’t think the MCU is going down the dinosaur road anytime soon but even if they do, I can pretty much guarantee that there will not be a character named Dinah Soar. This one has got to be my favorite. Mongoose was, at one time, a real mongoose. After some genetic alterations he became… a bigger, angrier and stronger mongoose. Knowing that, you would probably write him off as an insignificant villain, but you would be wrong. 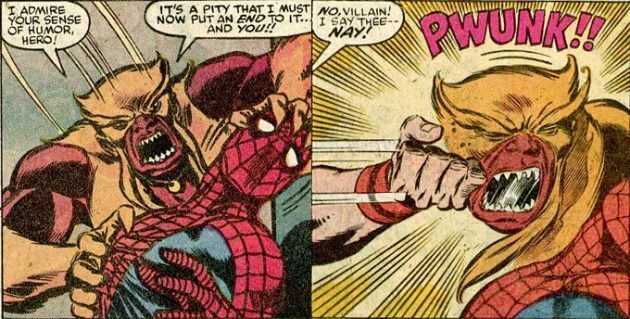 Mongoose was invited to become a member of the Masters of Evil. The Masters of Evil! A mongoose! That is a team that has included great villains like Baron Zemo, Doctor Octopus and Ultron! As if that wasn’t enough, Mongoose has had fights with Spider-Man and is considered a mortal enemy of Thor! For those keeping score at home, that’s the God of Thunder vs. a small carnivorous cat. I kind of want to see that fight, but I don’t think we will. Marvel really has created some ridiculous characters. Still, I’m reluctant to say that we will never see these characters in the MCU. After all, we have already seen Batroc the Leaper and Stilt-Man and we’ll be seeing Squirrel Girl soon as well. You never really know who might show up in the Marvel Cinematic Universe.